The ketogenic diet is a special high-fat, low-carbohydrate diet that is used as dietary therapy for patients with either intractable epilepsy or epilepsy that cannot be controlled with medications or where side effects of the medications prevent them from being used. The efficacy of the ketogenic diet is well-documented in children and there is ongoing research with adults. 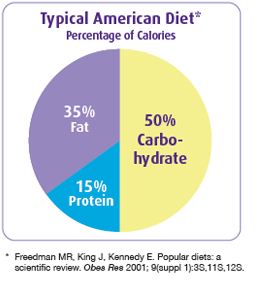 The ketogenic diet is a strictly controlled, precisely calculated, medically-supervised dietary therapy1. The diet should only be used under close medical and nutritional supervision. Research shows that just over 50% of children on the ketogenic diet will have 50% or more improvement in seizures2. 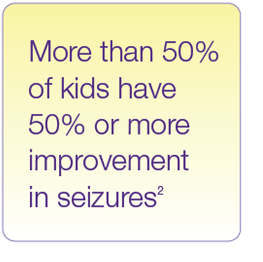 About 1/3 of children will have over 90% improvement in seizures and about 10-15% will become seizure-free. When dietary therapy is effective in controlling seizures, anticonvulsant medication can sometimes be reduced3 or even discontinued entirely4. Many parents also report improved development and behavior. What is the ketogenic ratio? The ketogenic ratio refers to the ratio of the grams of fat to the grams of protein and carbohydrate in the diet. The healthcare provider determines which ratio is most appropriate for each patient. The traditional ketogenic diet is usually a 4:1 ratio, however, adolescents and children under the age of 2 are often started on a 3:1 ratio to allow for more protein in the diet1. 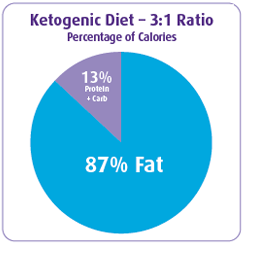 A ketogenic diet at a 4:1 ratio is 90% fat, while a diet at a 3:1 ratio is 87% fat. On a typical diet, the body primarily uses glucose (carbohydrate) for energy. The ketogenic diet works by shifting the body's metabolism from using glucose for energy to using mostly fat for energy, which produces biochemical changes in the body, and for some people, reduces seizures. How long do individuals typically stay on the diet? In cases when the diet is effective, it is generally used for at least 2 years5. After this time, the healthcare provider may recommend weaning off the diet. Many children are able to come off the diet without worsening of seizures. What type of seizures can the ketogenic diet help manage? The ketogenic diet is effective in different kinds of seizures and is not limited to any one type of epilepsy. However, research suggests that the ketogenic diet may be particularly beneficial for patients with infantile spasms, myoclonic-astatic epilepsy (aka Doose syndrome), Rett syndrome, Glut-1 deficiency syndrome, tuberous sclerosis complex, Dravet syndrome and children on a formula-only ketogenic diet, taken orally or through a feeding tube6. Are there any adverse effects of the ketogenic diet? There are side effects associated with a ketogenic diet, which is why it should only be done under medical supervision. The most commonly reported side effects are gastrointestinal disturbances such as constipation, nausea, vomiting, or diarrhea7. Consult with your child's healthcare provider to learn more about potential side effects. To help you get connected with health care professionals that initiate and manage the ketogenic diet, we have compiled a list of hospitals and medical centers that offer the ketogenic diet here. 1 Kossoff EH, Freeman J, Turner Z, Rubenstein J. Ketogenic Diets: Treatments for Epilepsy and Other Disorders; Fifth Edition. Demos Health Publishing, NY, NY, 2011. 2 Freeman JM, et al. The efficacy of the ketogenic diet-1998: a prospective evaluation of intervention in 150 children. Pediatrics. 1998 Dec;102(6):1358-63. 3 Kossoff EH, Pyzik PL, McGrogan JR, et al. Impact of early versus late anticonvulsant reduction after ketogenic diet initiation. Epilepsy and Behav 2004;5:499-502. 4 Gilbert DL, Pyzik PL, Vining EP, et al. Medication cost reduction in children on the ketogenic diet: data from a prospective study. J Child Neurol 1999;14:469-471. 5 Martinez CC, Pyzik PL, Kossoff EH. Discontinuing the ketogenic diet in seizure-free children: recurrence and risk factors. Epilepsia. 2007 Jan;48(1):187-90. 6 Kossoff EH, Zupec-Kania BA, Amark PE, et al. Optimal clinical management of children receiving the ketogenic diet: recommendations of the international ketogenic diet study group. Epilepsia. 2009;50(2):304-317. 7 Kang HC, Chung DE, Kim DW, Kim HD. Early- and late-onset complications of the ketogenic diet for intractable epilepsy. Epilepsia. 2004 Sep;45(9):1116-23.